The Philadelphia Union vs. New York Red Bulls game on June 23rd will be in honor of Mack. We are scheduling a number of events throughout the day to celebrate youth soccer and raise funds for the Mack Brady Memorial Men’s Soccer Fund at Penn State. 10 am-noon @ West Chester United Soccer Club Kids Soccer Clinic run by local coaches and Penn State Men’s and Women’s Soccer players and coaches. Special thanks to Soccer Shots for hosting our registration! The clinic will be located at Thornbury Soccer Park located at 1200 South Westtown Rd, West Chester, PA 19382. Here’s a link to their online directions can be found here. Register for clinic now via this form. 1-4 pm @ PPL Park Pre-Game Events & Auction Penn State coaches from a variety of sports will join us and an auction will be held featuring items from Penn State athletics, top international soccer players, and local attractions. 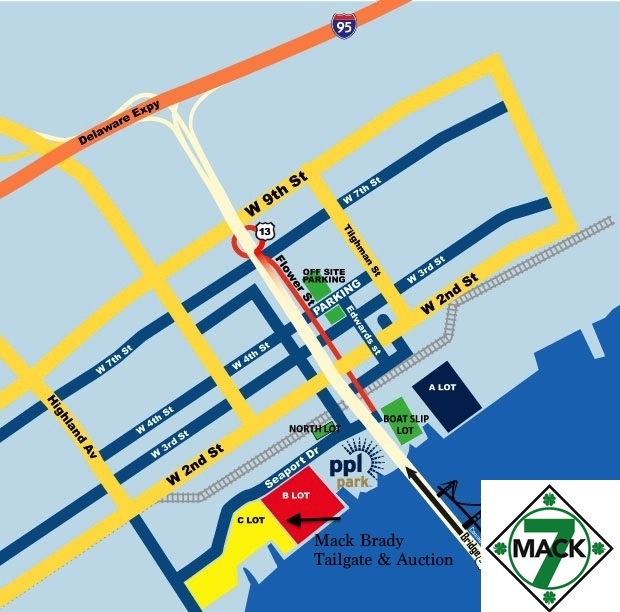 Auction Location Will be in Lot B, right next to Lot C and before the water. Look for our banner! 5 pm Kickoff! The Union has been wonderful and we are pleased to be able to offer $40 sideline tickets for the game with 25% ($10) will go to the Mack Brady Memorial Soccer Fund. The block ticket order has ended, but you can order your tickets online. Go to www.philadelphiaunion.com/promo and use the Promo Code MACK2013. The tickets, with processing fees will be $45.50 with $5 going to Mack’s Fund. Hotel Information If you would like to stay overnight even that will help support Mack’s Fund! The Days Inn in Chester, PA has offered a special rate, $79 per room/night and they will donate $20 per room/night to the fund! The hotel is only a mile from the stadium. Their phone is 610-876-7211 and the block of rooms is reserved under “Mack Brady.” Our contact is Jiten Patel. The block consists of 30 rooms that will be held until May 15. Hi I am Michael and I was on Mack’s soccer team and I miss him. Just checking in – when should we expect the tickets to get mailed out? Thanks! I placed the order with the Union last week. I should be receiving the tickets soon. I will let you all know when they arrive! thanks – also, will the Pre-Game Events & Auction be inside the stadium or is this like a tailgating activity? They will be in the tailgating area. We will post the precise location of our tents as soon as we have it from the Union. Hi, trying to purchase tickets and none are available. Ticket sales at the Union were unable to assist us. Lisa, did you try going to http://www.philadelphiaunion.com/promo and using the Promo Code MACK2013? Our block of tickets at $40 closed, although we may be able to do one or two tickets, depending upon how quickly you can respond. Just checking in…. Have the tickets been mailed out yet? Yes, tickets were mailed out on 6/15. We look forward to seeing you Sunday! I have not received my tickets yet…I paid for 2 early on…I live in Radnor, PA. Will it be possible to get copies on Sunday if they do not arrive? We have your request to pick up at the game. Look for our tailgate in Lot B next to Lot C.
Peter- I have your tix in hand. Feel free to call my cell at (814) 571-5709. We’ll be there for the pre-match activities! Great! We have some amazing items for auction.